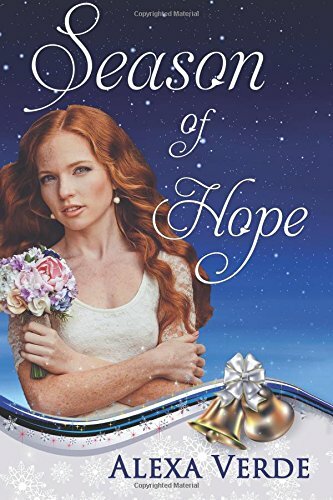 Season Of Hope by Alexa Verde is a sweet contemporary Christian romance. It is the third book in the Rios Azules Christmas series but can be read as a stand-alone. I however enjoyed catching up with familiar faces. Once more Alexa Verde has written a charming tale that amuses, warms and imparts godly wisdom. “Her faith helped her through the worst moments.” Faith is not a crutch but faith sustains us through life. As we build a relationship with God, we know that we will never be alone. Prayer is our hotline to heaven. We can use prayer to thank God as well as to ask for help. The novel shows how loss consumes us – either by living lives in isolation or by letting the burden of guilt and unforgiveness consume us. Letting the past impact the present is never good. “Sometimes we let our past impact our future way too much.” We need to give our burdens to God and learn to live and trust again. This links to healing – a healing from our past and physical healing caused by a spate of DIY disasters. Fame and fortune make for poor friends as we can still feel “hopelessly lonely.” True friends are hard to find. Self confidence is another issue. We must not compare ourselves to anyone except the person we used to be. The media does not help in the awareness of body image as they present size zero air brushed examples of supposedly ‘perfect’ bodies. There is the theme of addiction, in this case, prescription drugs. The habit has been kicked but the craving remains. “Only his grandma’s teachings stopped him from getting a bottle of pills and downing several.” Seeds of faith sown in childhood remain. Season Of Hope was a delightful book. I love Alexa Verde’s writings – warm stories with likable characters and grounded in God. 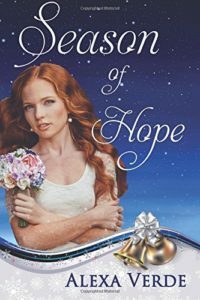 Season Of Hope is a real feel-good story for any time of year. What a wonderful, thoughtful review! I’m so glad you enjoyed reading my book. Thank you so much, Julia!